A little while ago, Blogger introduced this "Stats" thing where you can keep track of, well, stats. It's a good thing they gave it such a logical name like "Stats" instead of something like "SUPER FUN BRIGHT PURPLE ELEPHANT". Because you would more likely than not be clicking on that link and expecting a super fun bright purple elephant and instead see a page full of stats. How misleading. And dull. Stats? Where's my super fun bright purple elephant? While some of yous might prefer a super fun bright purple elephant, I for one would not. I mean, have you considered how much a super fun bright purple elephant would eat and drink? And where would it sleep? Do you have room in your house for a super fun bright purple elephant? And no, you can't keep it in your garage. Jeez. That's why I prefer the stats. Not only do they not require food, water, or shelter, but they also tell you fun, somewhat stalker-ish things about your blog! For example, how many people looked at my bloggy today, and what browser they were using, and what country they are from. Whoa! How very statistical. 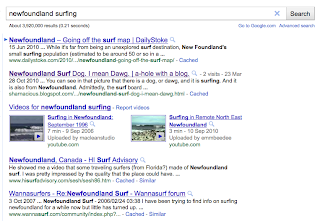 Apparently I must be some sort of official expert on the surfing to be had in Newfoundland, as my blog comes up second in Google. 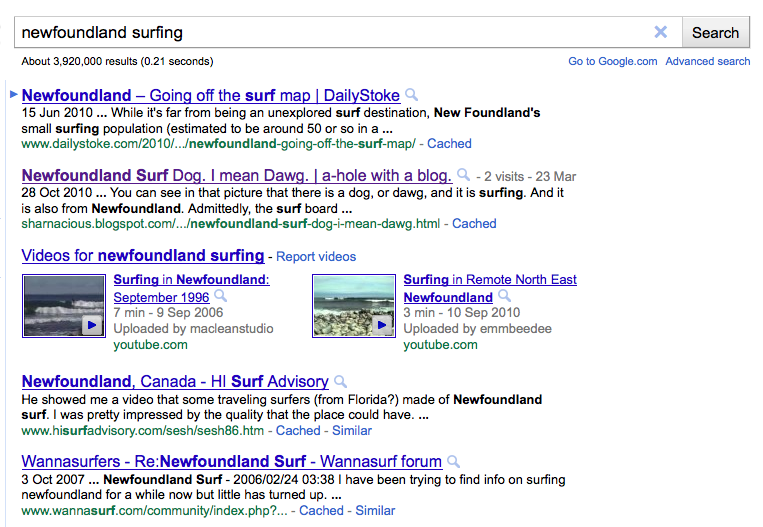 I had no idea there was even surfing in Newfoundland. Wouldn't it be too cold and puffin-y? That blog post I wrote was mostly about a sign I saw where a Newfoundland dog was surfing. I guess if a dog can surf in Newfoundland, people can too. On top of surfing in Newfoundland, I am also an expert in the exciting world of concrete crafts. What? You didn't realize crafts could be made out of concrete?! Neither did I. But when I was trapped on Bell Island in Newfoundland last summer, I got to see some concrete crafts up close. 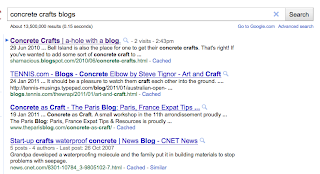 Man, those Bennetts sure do know their concrete crafts. 3. "vanilla thunder teddy westside"
The fact that my blog comes up very first in Google for this search pleases me immensely. Those are two of the characters' nicknames from one of my favourite shows, How I Met Your Mother. Last fall, I blogged about my extreme love of HIMYM. And now, Google recognizes that love. 4. 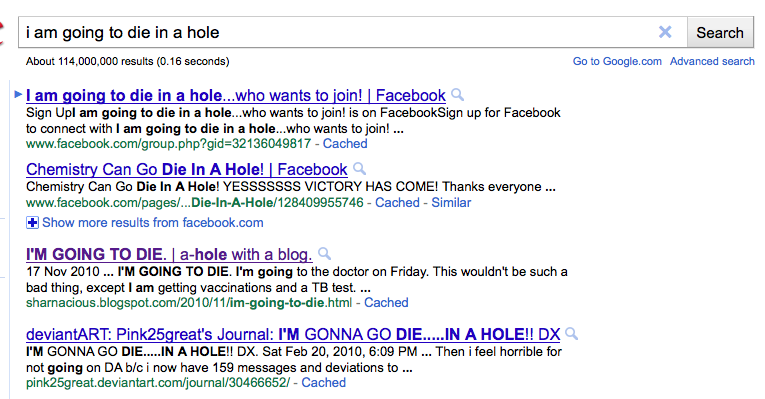 "I am going to die in a hole"
I feel bad for this person who was going to die in a hole. Clearly, they were searching for guidance of some kind. Maybe what kind of hole was best to die in. Or perhaps a recommendation on a shovel brand if they were planning on digging their own hole. 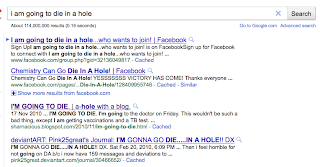 Or maybe they were looking for suggestions about how to NOT die in a hole. (My advice: don't fall in them.) 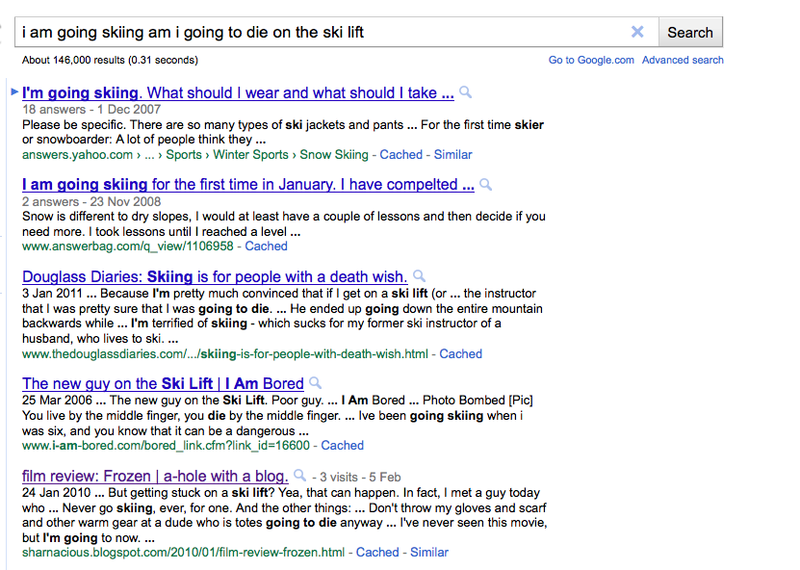 Instead, they ended up finding my blog about one of my most intense fears. Which isn't dying in a hole, by the way. 5. 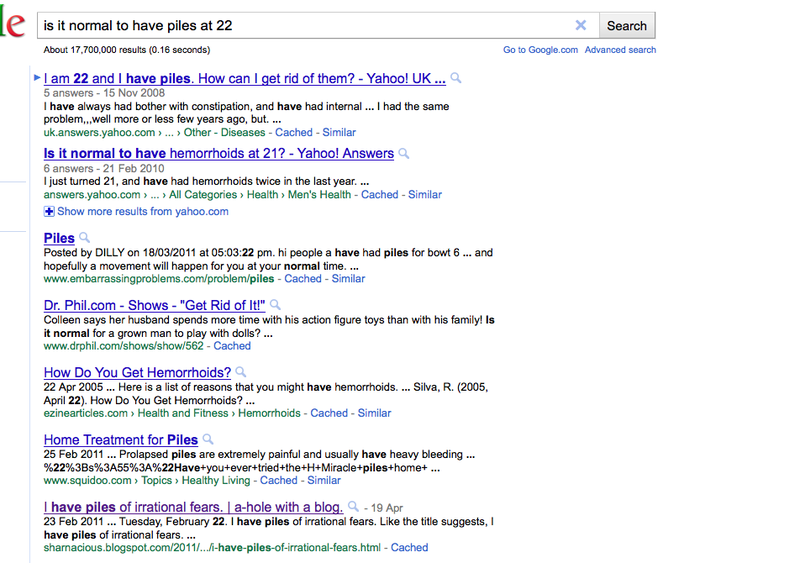 "is it normal to have piles at 22"
I have no idea. 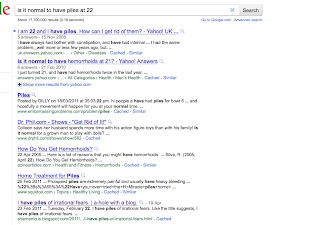 You should probably go ask a doctor instead of a search engine. 6. 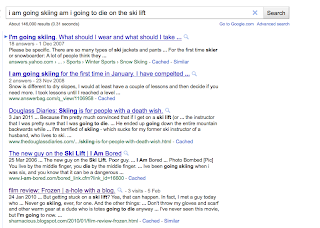 "I am going skiing am I going to die on the ski lift"
According to this movie, yes, yes you will. Well, not actually ON the ski lift. First you'll fall off and then you'll get eaten by wolves. 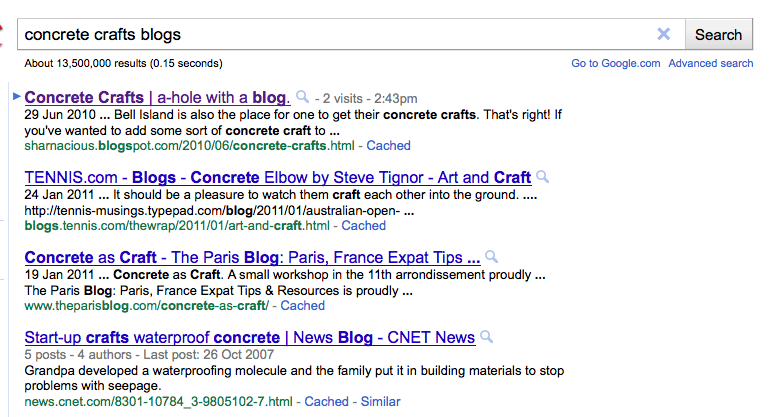 This is one of the most searched for things that brings up my blog. Every month it's a little bit of "frozen guys eaten by wolves", "falling off chair lift and dying", "did two guys really get eaten alive by wolves in frozen? ", blah blah blah. I guess the premise of this movie has really plagued the masses. And I'm just glad I was able to shed some light on the subject. Also, never see that movie. Ever. 7. "fruit wrinkles for sale"
8. 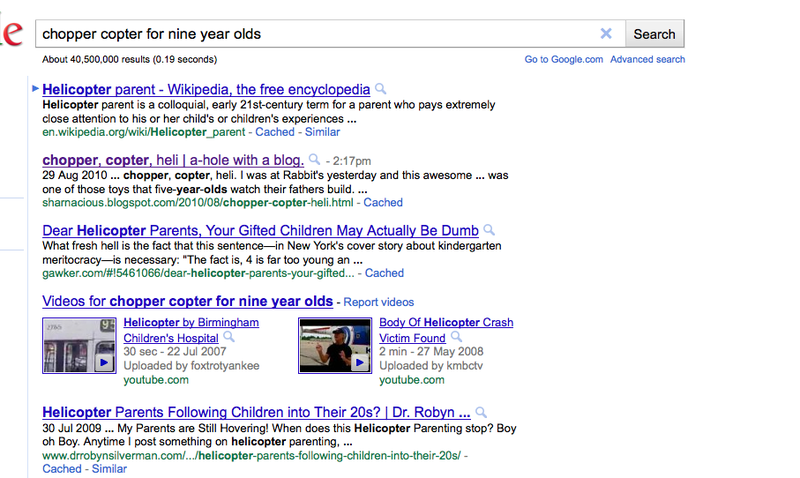 "chopper copter for nine year olds"
I'm fairly certain that nine year olds should not be operating helicopters. Any sort of heavy and/or flying machinery, really. But especially helicopters. Or tanks. Tanks would be overly dangerous too. 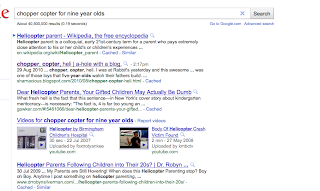 Unless a "chopper copter" is some sort of toy? The wooden one I made was loads of fun! 9. "toaster strudel why so important"
I don't actually have a screen grab for this one because my blog didn't show up on the first page. Or even the first fifteen pages, for that matter. And I got tired of looking after that. The reason my blog will eventually come up is because I wrote one entitled "I invented Post-Its. And Toaster Strudel. Naturally, it had nothing to do with either. Hopefully whoever it was ended up finding out the answer to their question.